Even if you do not know the name, it is unlikely you do not know the work. 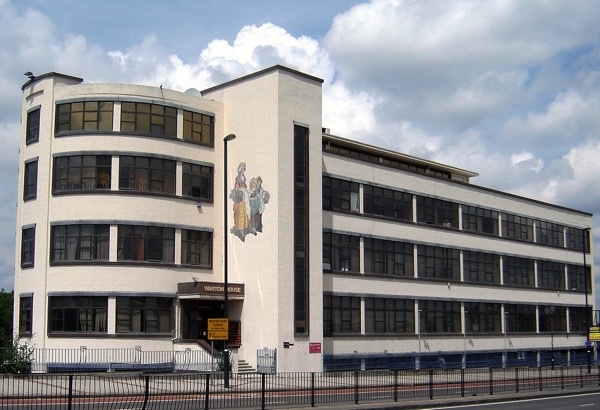 You may have seen his prints being sold off cheap at car boot sales and charity shops, or perhaps your granny had a talcum powder tin with one of his pictures on it, or you have driven past his figures twenty-feet-high on the side of the former Yardley factory in Stratford? 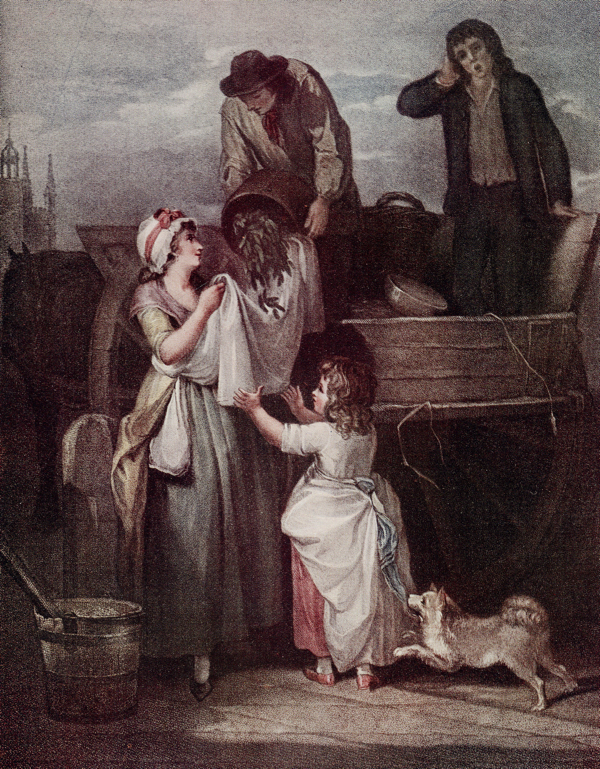 Artist Francis Wheatley created the most celebrated images of Cries of London which are still universally recognised today, although he received little recognition in his lifetime. 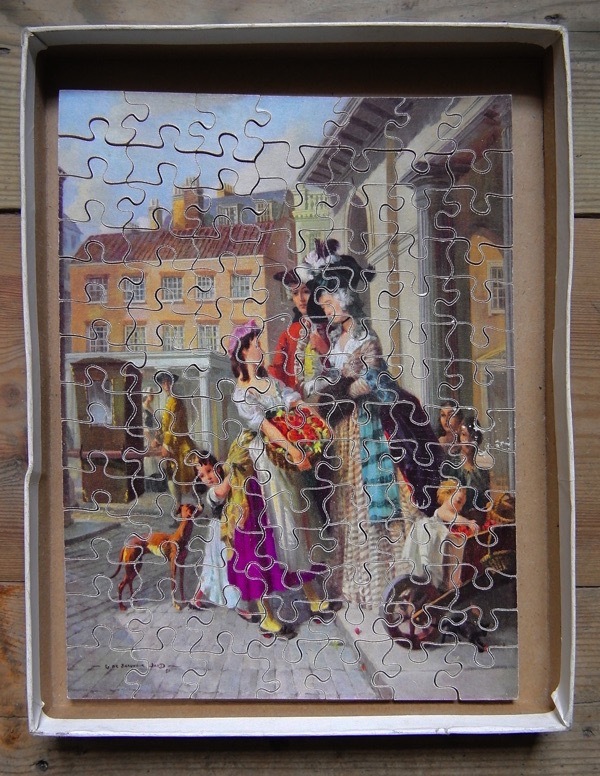 By accident of fate, his work achieved its greatest success in the twentieth century, gaining widespread popularity and becoming symbolic of the spirit of old London – until it fell out of favour with subsequent generations, devalued by its ubiquity and dismissed as sentimental cliche. 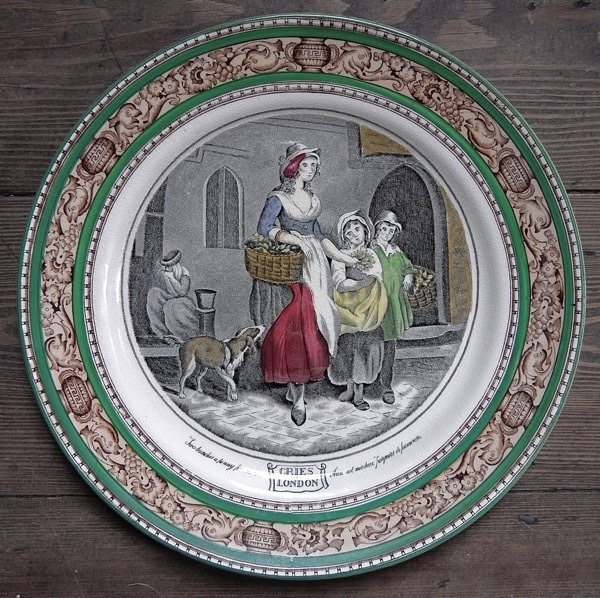 Yet Francis Wheatley’s Cries of London deserve a second look and, once you know the circumstances of their creation, it is not so easy to write them off. 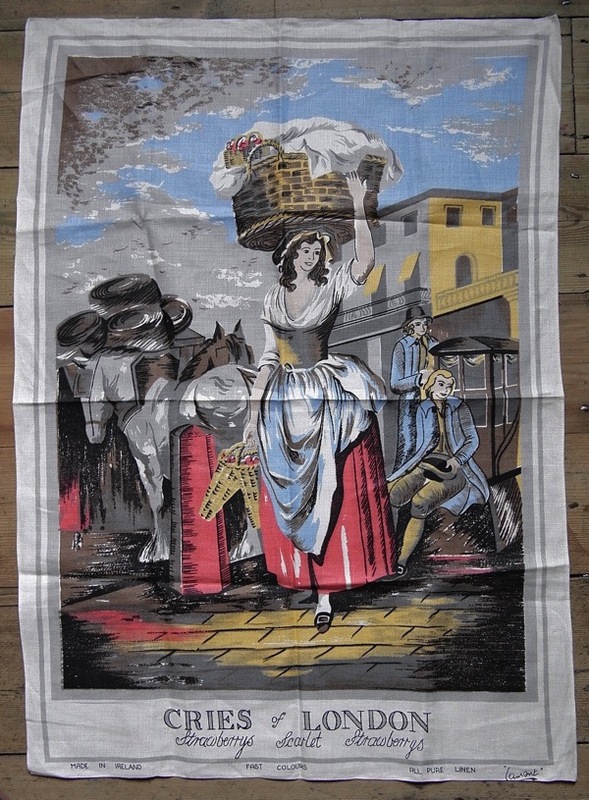 They became commonplace in the last century because people loved them, investing personal meaning in these cheaply-distributed images and, by treasuring these mass-produced souvenirs, trinkets and keepsakes, they charged them with a significance that transcends sentiment. Recognising the curious legacy of Francis Wheatley, I cannot resist collecting all the multiple incarnations of his work which others discard and giving them a home to cherish them on behalf of their former owners, on behalf of the artist himself and on behalf of the street traders of London down the ages who are the dignified subjects of these fascinating pictures. 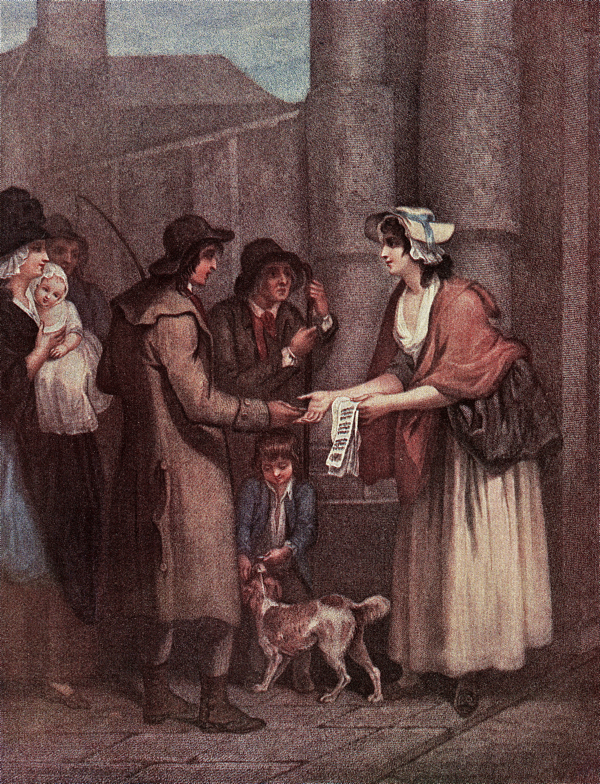 Francis Wheatley’s Cries of London deserve better than being consigned to the dustbin of cultural history. 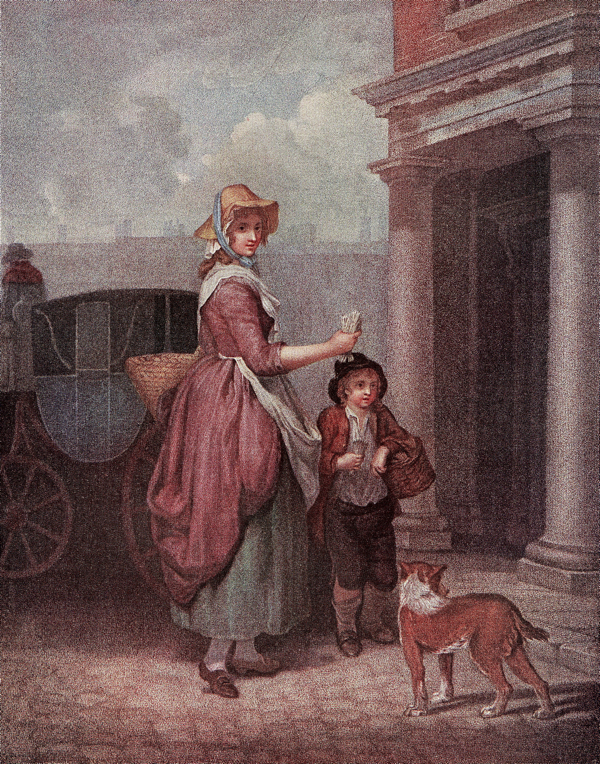 Francis Wheatley exhibited his series of thirteen oil paintings of Cries of London at the Royal Academy over three years beginning in 1792. 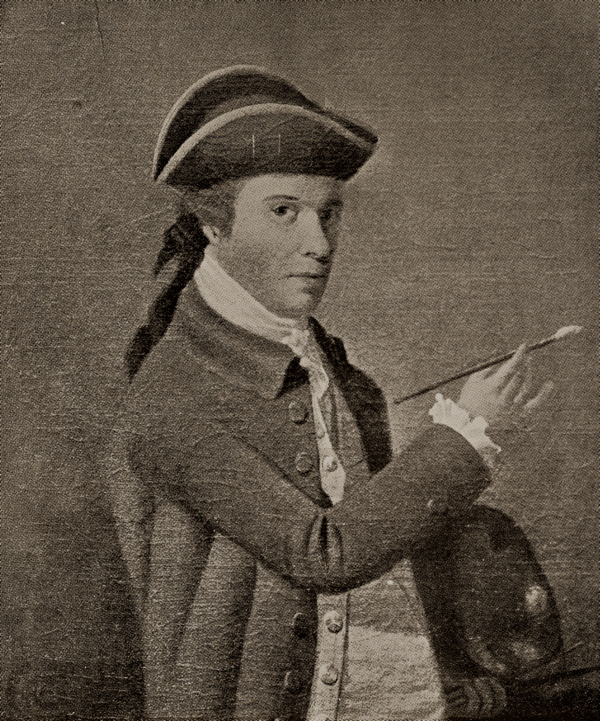 Two years earlier, the forty-three year old painter had been elected as an Associate to the Academy by sixteen votes to three, in preference to Thomas Lawrence, the King’s nominee, and – as a consequence – he scarcely secured any further commissions for portraits from the aristocracy. He lost his income entirely and, becoming an Academician, which should have been the crowning glory of his career, was its unravelling. 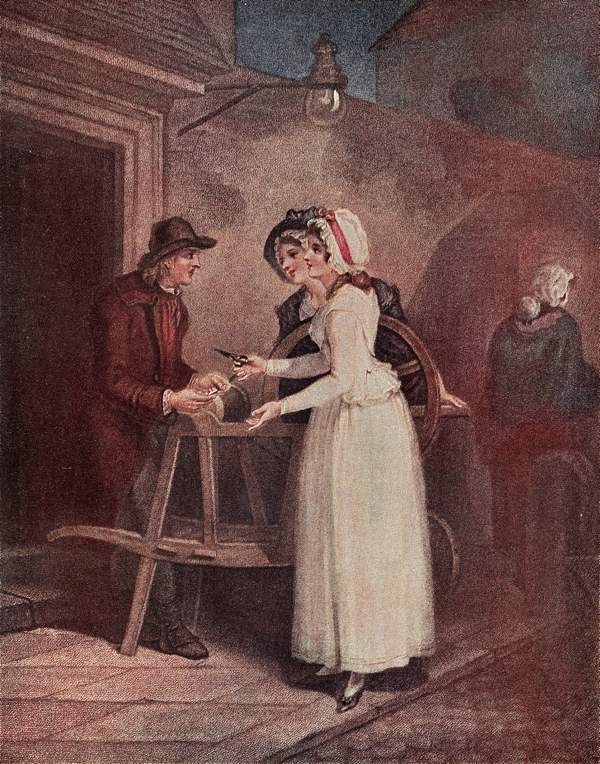 Wheatley was declared insolvent in 1793 and struggled to make a living until his death in 1801 at fifty-four years old in King’s Bench Walk prison, when the Royal Academy paid his funeral expenses. 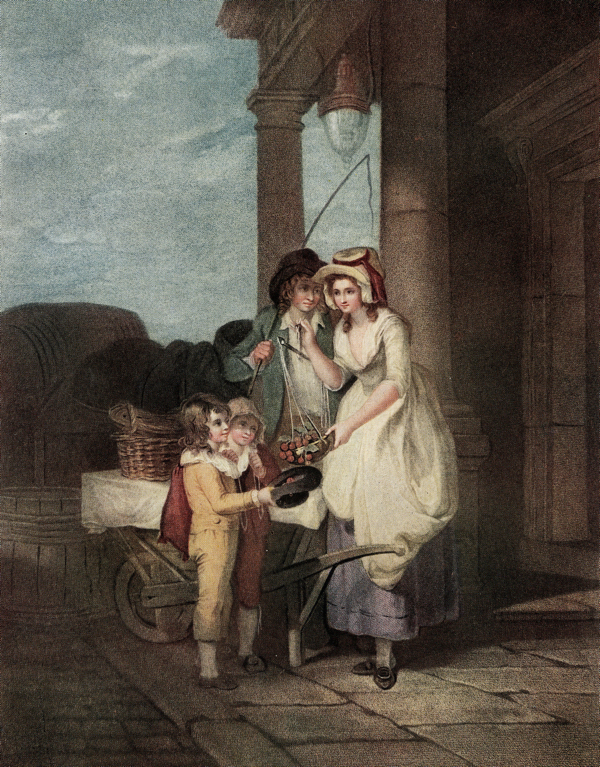 In the midst of this turmoil, lacking aristocratic sitters, Wheatley created these images of street sellers which, although regarded in his lifetime as of little consequence beside his society portraits, are now the works upon which his reputation rests. 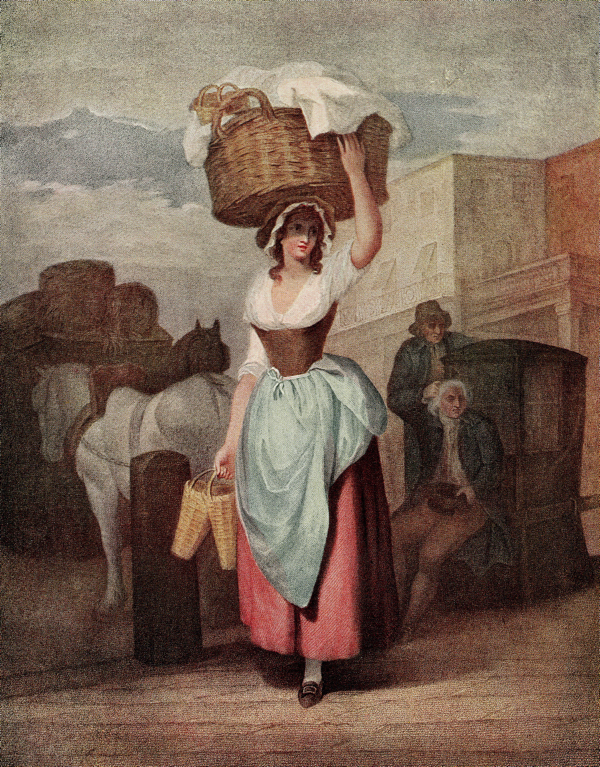 Born in Wild Court, Covent Garden, in 1747, Wheatley was ideally qualified to portray these hawkers because he grew up amongst them and their cries, echoing in the streets around the market. The stone pillars of Covent Garden that stand today may be recognised in a couple of these pictures, all of which were located in vicinity of the market. 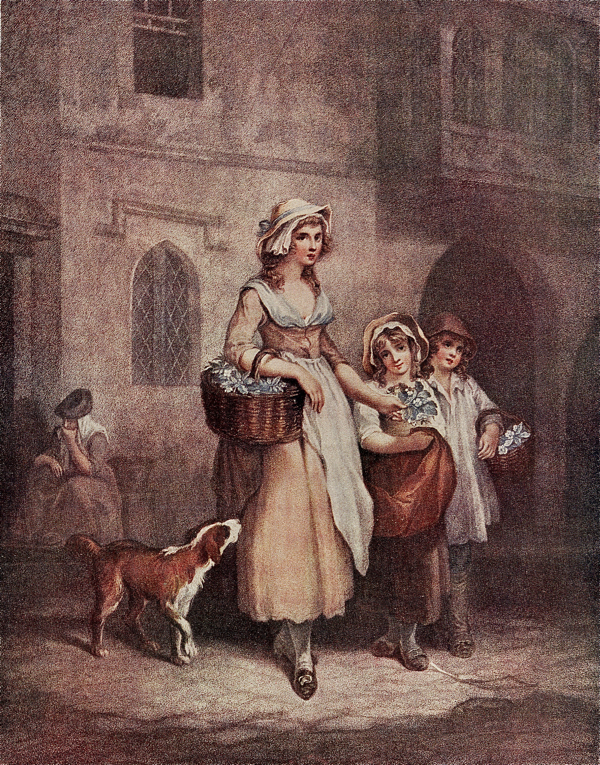 However, these idealised images are far from social reportage and you may notice a certain similarity between many of the women portrayed in them, for whom it is believed his second wife, Clara Maria Leigh, was the model – herself a painter and exhibitor at the Royal Academy. 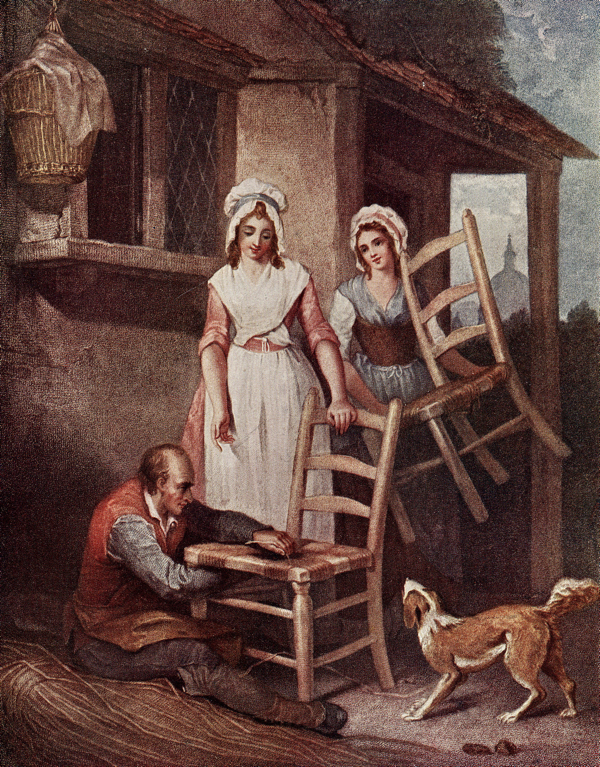 Look again, and you will also see variants of the same ginger and white terrier occurring in these paintings – this is believed to be Wheatley’s dog. 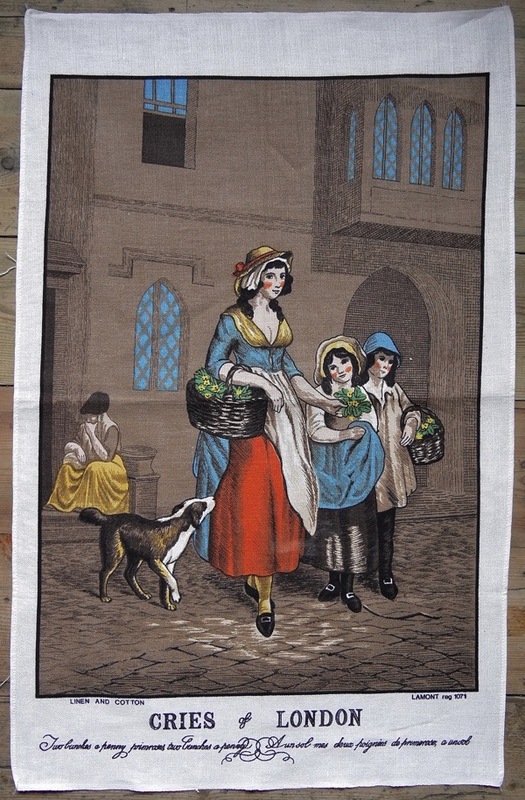 The languorous poise and artful drapery of Wheatley’s figures suggest classical models, as if these hawkers were the urban equivalents of the swains and shepherdesses of the pastoral world. 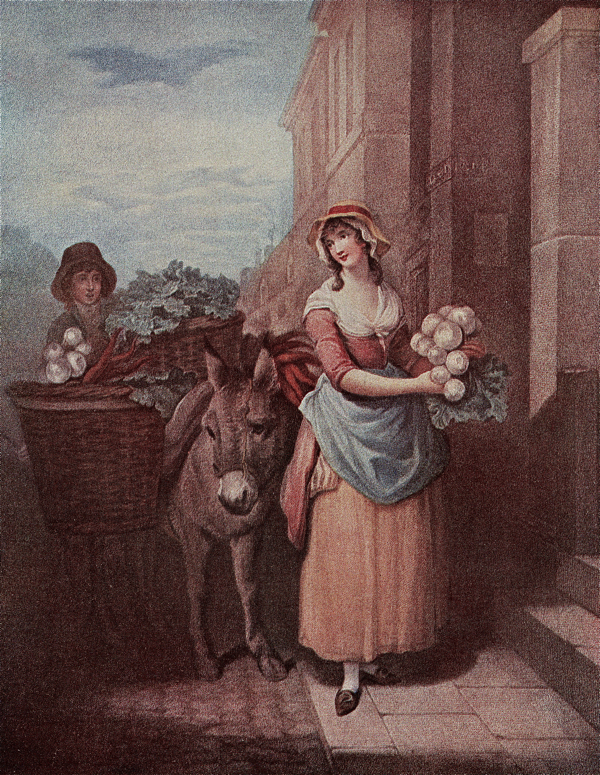 Influenced by Jean-Baptiste Greuze, Wheatley had painted agricultural workers at harvest and several of the Cries he depicted are those who came to the city to sell their produce. 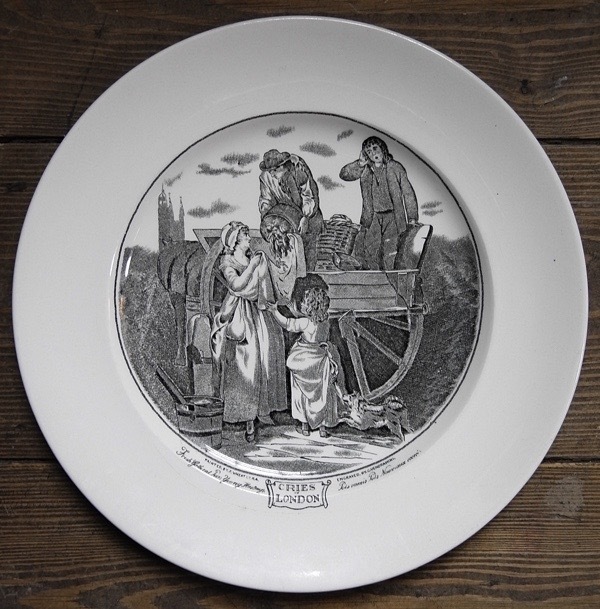 Although too late save his career, engravings of Wheatley’s Cries were sold at seven shillings and sixpence for a plain set and sixteen shillings coloured, and the fact all thirteen were issued is itself a measure of their popularity. In 1913, Yardley of London, cosmetic and soap manufacturers, revived Wheatley’s primrose seller by adopting it as their symbol, replacing primroses with sheafs of lavender to illustrate their most popular fragrance, Old English Lavender. 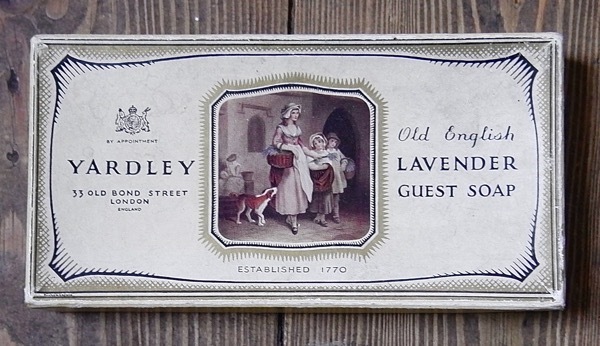 Established in 1770, perhaps Yardley sought an image that reflected the era of their origin and the lavender grown for the company in the south east of England. 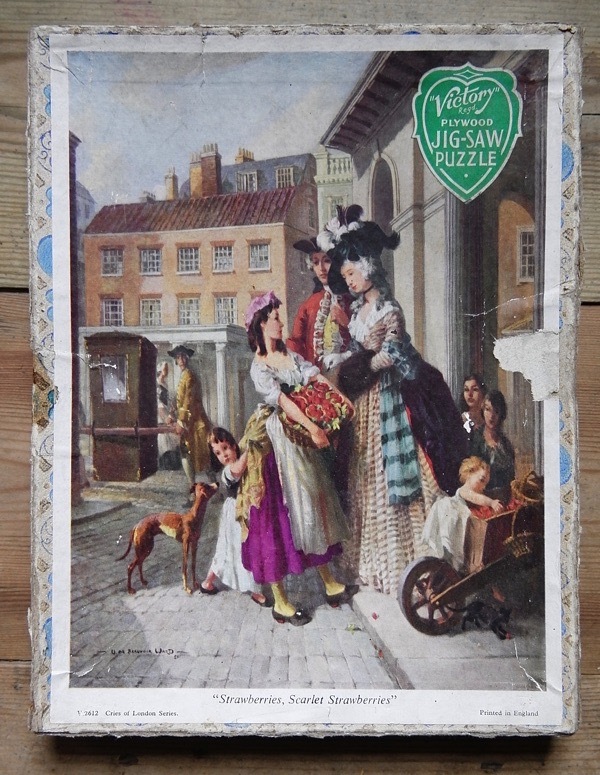 Publishing Wheatley’s image upon countless thousands of soap packets and talcum powder tins was such a popular success that it is still in use upon their packaging over a century later. 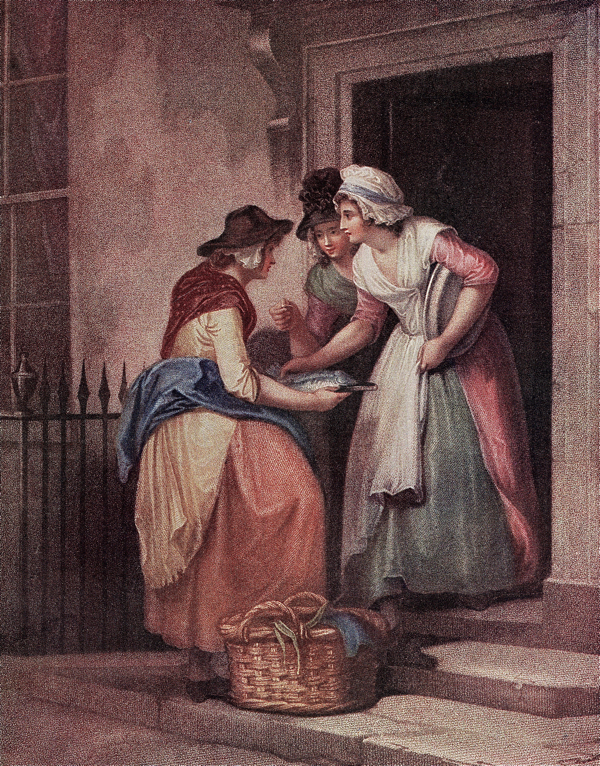 The Wheatley revival took flight in 1916 when Players cigarette cards included all of his images in a set of twenty-five Cries of London, reworking Cries by other artists in the Wheatley style to make up the series and following these cards with a second set of twenty-five the year after. Collected by schoolboys in class and soldiers in the trenches, these minor tokens of intangible value became venerated as rare keepsakes. 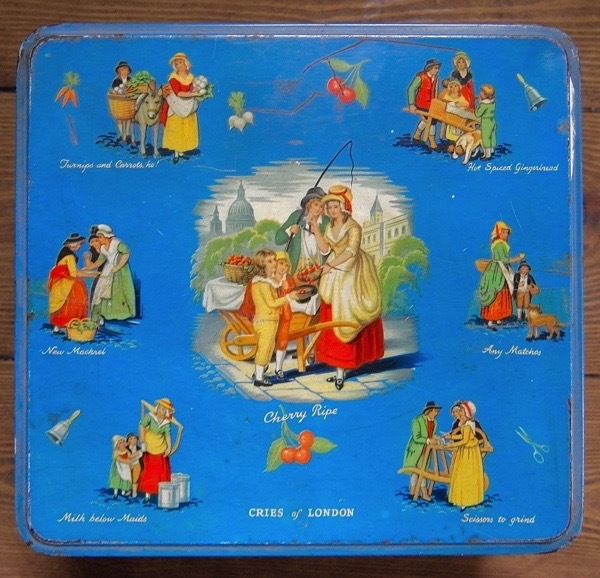 And, throughout the twentieth century, Wheatley’s Cries were reprinted in many guises and upon all kinds of souvenirs and knick-knacks as popular icons of London, representing the collective sense of emotional ownership that people felt for the ancient capital and its wonders. 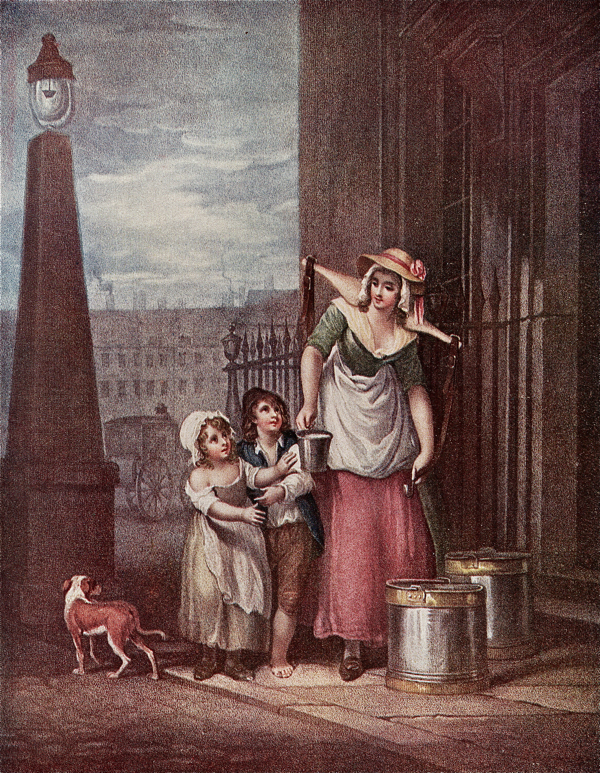 It was an unlikely choice for Francis Wheatley to paint ‘Cries of London’ at the time he was losing grip of his life – struggling under the pressure of increasing debt – since they cannot have been an obvious commercial proposition. 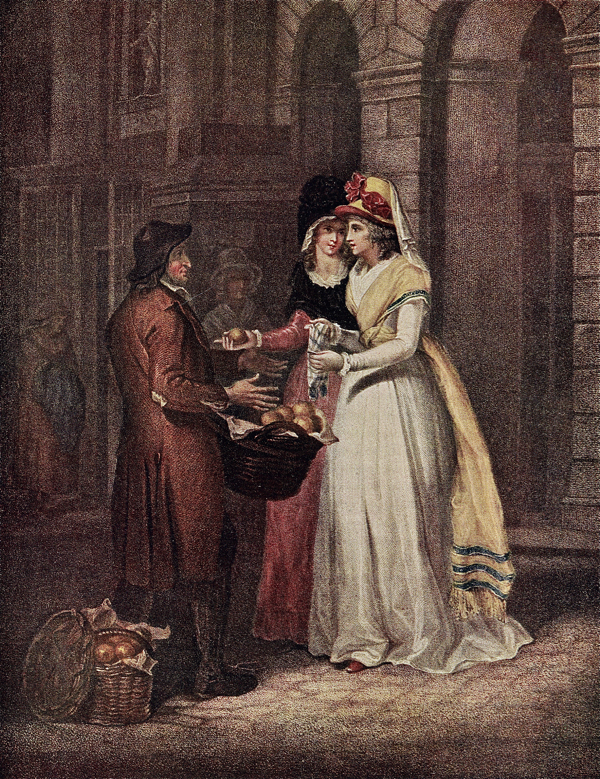 Yet I like to surmise that these fine images celebrate the qualities of the people that Wheatley experienced first-hand in the streets and markets, growing up in Covent Garden, and chose to witness in this affectionate and subtly-political set of pictures of street traders, existing in pertinent contrast to the portraits of aristocratic patrons who had shunned him when he was in need. This is the curious legacy of Francis Wheatley. Fresh Gathered Peas, Young Hastings! Sweet China Oranges, Sweet China! Knives, Scissors & Razors to Grind! 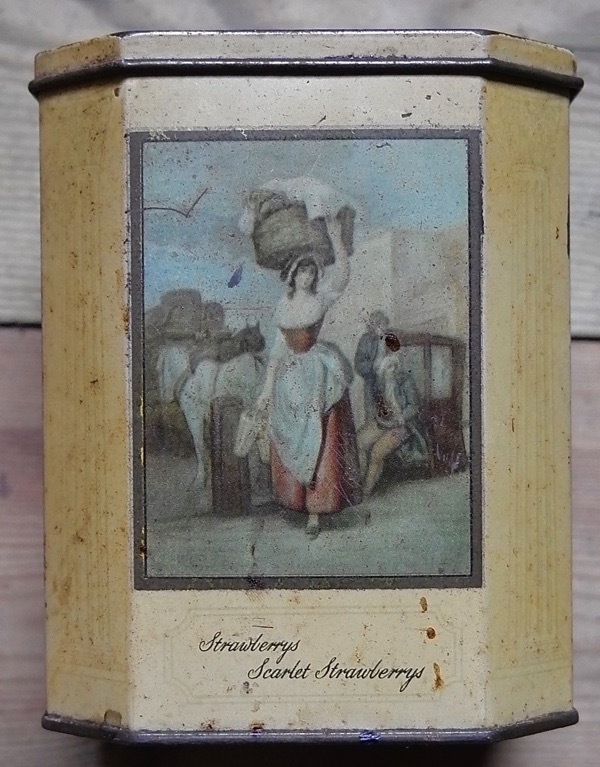 Round & Sound, Five Pence a Pound, Duke Cherries! A New Love Song, only Ha’pence a Piece! Hot Spiced Gingerbread, Smoking Hot! 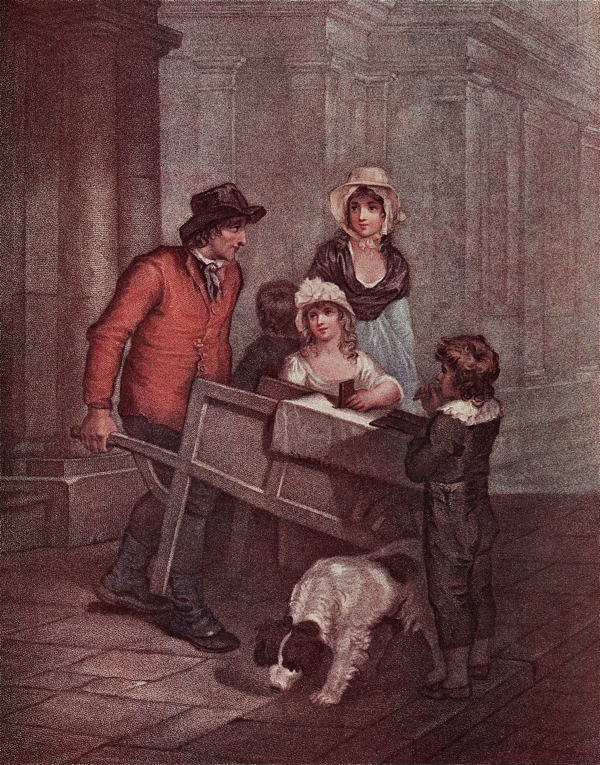 Accompanying my forthcoming book of Cries of London published on 12th November, Bishopsgate Institute is staging a festival around the history and politics of markets and street trading, and Spitalfields Music is opening its Winter Festival with a concert of Cries of London by Fretwork on 4th December at Shoreditch Church. Memory Lane!! 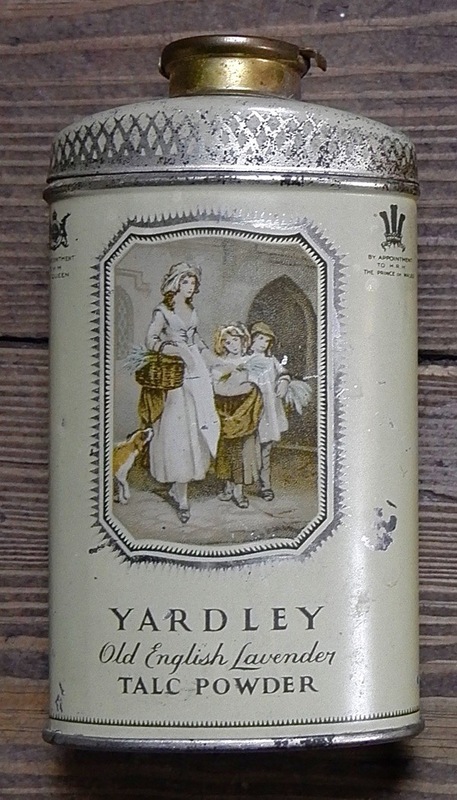 How well I remember leaning out of the car window in the 50′s as we passed the Yardley factory to sniff the lavender odour. Dad always wound the window down but was it just imagination?! Did they really perfume the air? Usually more pong than perfume! Thank you for an interesting article – how very sad his life turned out that way. they’re patter. I wonder if this has disappeared? yet another piece of the china tea service on his head! Etc, etc.